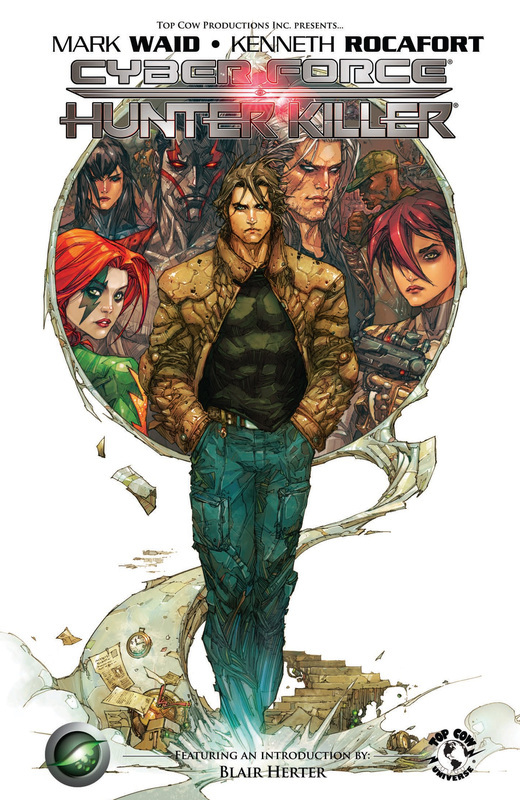 Top Cow's technology based teams collide in a critical crossover event that will have everyone talking this summer! The Hunter-Killer team's directive to hunt down and detain rogue Ultra-Sapiens brings them head to head with the Cyberforce team in a brutal showdown that leaves more than one member bleeding. But who is manipulating these two teams into conflict and to what end? The team of writer and Hunter-Killer co-creator Mark Waid (Amazing Spider-Man, Irredeemable) and artist Kenneth Rocafort (Astonishing Tales, Madame Mirage) bring you a crossover filled with epic action, intrigue, lies, and betrayal. Featuring two connected covers by series artist Rocafort and a third variant cover by Mike Choi and Sonia Oback (Uncanny X-Men, X-Force). Three hundred years have passed since the death of Ezra, but her memory still haunts Kade. He has traveled the world searching for the demons that will bring closure to his past. His quest for the demons that plague our earth has led him to the Land of the Rising Sun. He senses a demon he must banish, but there's another person he senses. Is it the return of Ezra? Or is it the beautiful assassin Shi? The critically acclaimed hit is back with an all-new adventure! There's no rest for the weary as the kids' summer vacation takes a bizarre twist when someone from their past rises from the dead to wreak havoc on Freese College. An all-out, action-packed brawl filled with drama and laughs, told through the sky-high eyes of the Intoxicator! Co-created by 'Robot Chicken' maestro Seth Green and written by the 11th fattest man on Earth, Hugh Sterbakov, FRESHMEN is an uproarious combination of superpowers and college comedy, featuring art from Top Cow's latest find, Sheldon Mitchell. WHO IS THE GREEN HORNET? A hero? A criminal? He doesn't even know, himself... In a near future where the financial crisis never resolved, Chicago is more corrupt than ever. The rich are few and wield unimaginable power and influence. The poor are countless and live without hope. Gangs vie for control of the streets. Heroes have long been forgotten... Until now. Witness the birth of a new GREEN HORNET in THE GREEN HORNET STRIKES! #1. An ultimate tale in the making, THE GREEN HORNET STRIKES! Features the writing of acclaimed Lone Ranger scribe Brett Matthews, cover artist John Cassaday and interior artist Ariel Padilla! On the Fastrack chronicles the comic misadventures at Fastrack Inc., a wry mirror of the contemporary work scene. Ruthless boss Rose Trellis runs Fastrack, Inc. and thrives in an atmosphere of corporate political intrigue and back-stabbing... The strip is sprinkled with office romance, computer technology mayhem and lovesick moat monsters. Edge City is an American syndicated comic strip created by the husband and wife team of Terry and Patty LaBan. The couple teams to write the strips with Terry handling the art. Distributed by King Features Syndicate, the strip debuted in 2000. Edge City is a daily comic strip internationally syndicated by King Features, that satirizes modern family life through the eyes of a post-Baby Boomer, Jewish-American family. It concentrates on the relationship between Abby, a therapist in private practice, and Len, an aging urban hipster who co-owns a delivery service and plays in a weekend rock band, as they juggle the pressures of running their careers and dealing with their two kids, Colin, ten, and Carly, eight. There are also a number of peripheral characters, like Rajiv, Len's Indian-American partner, and Abby's parents. The strip generally takes the form of simple stories that last about two weeks and explore some kind of issue or incident, like Abby having insomnia or Len joining a Led Zeppelin cover band. Cornered is a single panel style comic strip by Mike Baldwin. It was launched on April 1, 1996. On dailies, Cornered usually has characters' dialogue below the panel, whereas on Sundays the characters' dialogue is often in speaking bubbles. Everybody, including animals, wears glasses. Cathy is a comic strip drawn by Cathy Guisewite. It features a woman who struggles through the "four basic guilt groups" of life — food, love, family, and work. The strip gently pokes fun at the lives and foibles of modern women. Cathy's characteristics and issues both made fun of and sometimes fed into negative stereotypes about women. The strip debuted on November 22, 1976, and at its peak appeared in over 1,400 newspapers. The strips have been collected into more than 20 books. Three television specials were also created. Guisewite received the National Cartoonists Society Reuben Award in 1992 for the strip. Broom-Hilda is an American newspaper comic strip created by cartoonist Russell Myers. Distributed by the Tribune Media Services, it depicts the misadventures of a man-crazy, cigar-smoking, beer-guzzling, 1,500-year-old witch and her motley crew of friends. The original idea for Broom-Hilda came from Elliott Caplin, brother of Li'l Abner cartoonist Al Capp. He described the main character to Myers, who responded with a sketch of the witch and several samples. Caplin, acting as Myers' business manager, submitted these to the Chicago Tribune Syndicate. Introduced on April 19, 1970, it became an immediate success. Broom-Hilda was reprinted in several collections during the 1970s and 1980s. Cartoonists Eric and Bill Teitelbaum skewer the world of business and finance in Bottom Liners, a nationally syndicated business comic panel appearing six times weekly. Bottom Liners tackles subjects such as foreign takeovers, office politics, getting a raise and the fast-paced world of Wall Street.